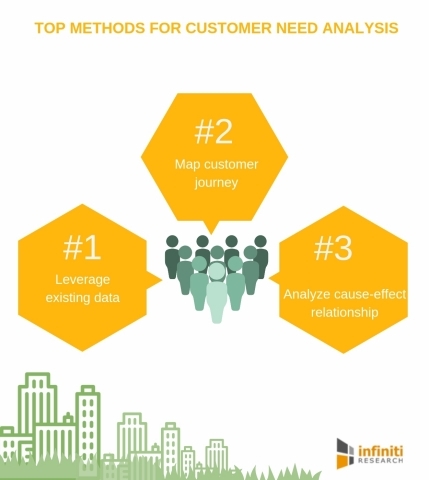 LONDON--(BUSINESS WIRE)--A well-known customer intelligence company, Infiniti Research, has announced the completion of their recent article on an introduction to customer need analysis. Identifying the changing customer needs in the ever-dynamic business environment can prove to be a challenging task. Customer need analysis solutions are designed to help companies to understand customer needs and their position in the overall market. It is a valuable technique to gauge better marketability of a product or service. Meeting customer needs at the earliest not only helps businesses gain a first mover advantage but also improves the company’s goodwill in the market. Customer need analysis tools uncover the unmet needs of target customers. It is then possible to act upon them to provide better experiences to the customers. Taking strides to meet the needs of the target customers will help align with other internal teams at the organization including the sales team, customer support team, and the product team. Finding it difficult to identify unmet customer needs? Get in touch with our experts to know more about how our customer need analysis solutions can help your business. The company’s existing database including customer interviews, past surveys, and customer-support call logs can be effective in tracking unmet needs of customers. This a highly cost-effective method of customer need analysis as it does not involve investing in extensive research campaigns. Mapping customer journey is an effective customer need analysis method. It is a visualization of processes that a customer encounters with a product or service. It includes multiple phases and touchpoints from the prospect of a loyal customer. This easily helps companies identify the points of friction and opportunities of improvement. At times, thinking about the effect of a situation will help business leaders solve problems with ease. By making the most of surveys and information gleaned from external data sources, business leaders can pin-point the root cause of a problem and improve customer retention capabilities. Request for more information and know how we can help you create strategies that will give you a first-mover advantage in the market.